Lobster brings a touch of elegance wherever it’s added but this creamy and flavourful carrot soup can certainly stand alone without it. 1 In a large saucepan, heat the butter over a medium heat. Add the onion and cook, stirring, until translucent but not browned, about 5 minutes. Add the carrots and garlic and cook, stirring, for 3 minutes. Add the cumin, smoked paprika (if using) and chicken broth, and bring to a boil. Reduce the heat to low, and simmer, covered, until the carrots are tender (15 to 20 minutes). Remove the pan from the heat and allow the soup to cool for 10 minutes.2 Prepare a large bowl of ice water, and set aside. Immediately strain each batch through a fine sieve into a metal bowl. Season with salt and white pepper. Place the metal bowl into the bowl of ice water to chill the soup quickly, stirring every 15 minutes or so. When it is chilled, cover and refrigerate until it is completely cold, about 1 hour. 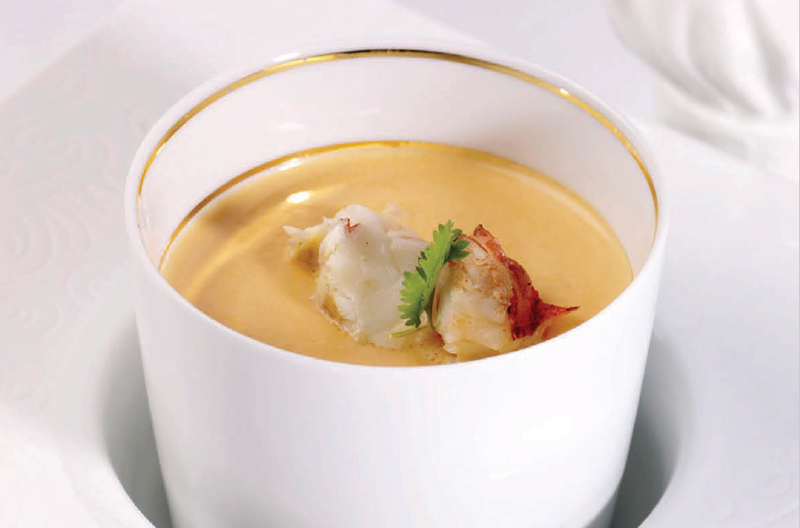 3 To serve, divide the cold soup among chilled soup bowls, and top with the diced lobster meat if using. The soup can also be served hot (see below). When reheating, be sure to bring the soup up to 165 degrees F very quickly and then serve immediately. If serving cold, keep the temperature below 41F.